1 of 4 In small saucepan, heat together 1/4 cup heavy cream, the peanut butter and 1/4 cup confectioners sugar over medium heat, stirring until smooth. Remove from heat; let cool to room temperature. 2 of 4 Meanwhile, beat together remaining 2 cups heavy cream and remaining 3/4 cup powdered sugar until stiff peaks form. 3 of 4 Fold cooled peanut butter mixture into whipped cream along with chopped peanut butter cups. Spoon into prepared crust. 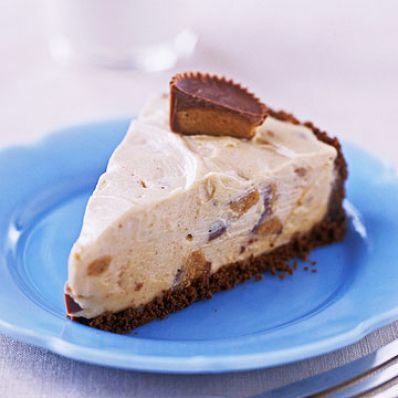 Top with peanut butter cup halves. 4 of 4 Freeze until semi-frozen, about 3 hours. Cut into 12 slices and serve.